The Frederick G. Gardiner Expressway, commonly known as the Gardiner Expressway or simply the Gardiner, is a municipal expressway in Toronto, Ontario, Canada. Running close to the shore of Lake Ontario, it extends from the foot of the Don Valley Parkway (DVP) in the east, just past the mouth of the Don River, to the junction of Highway 427 and the Queen Elizabeth Way (QEW) in the west, for a total length of 18.0 kilometres (11.2 mi). East of Dufferin Street to just east of the Don River, the roadway is elevated for a length of 6.8 kilometres (4.2 mi), making it the longest bridge in Ontario. It runs above Lake Shore Boulevard east of Spadina Avenue. The highway is named after the first chair of the now-defunct Metro Council, Frederick G. Gardiner, who championed it, the Don Valley Parkway and Spadina Expressway projects. The six-lane section east of the Humber River was built in segments from 1955 until 1964 by the Metropolitan Toronto government with provincial highway funds. The ten-lane section west of the Humber was formerly part of the QEW provincial highway. The Gardiner Expressway is now wholly owned and operated by the City of Toronto. The condition of the highway has deteriorated over the years. The highway has been described as "an out-of-date, crumbling and frequently traffic-jammed freeway." Extensive repairs became necessary in the early 1990s, and significant commercial and residential development has occurred in the core. As a result of these, the Gardiner has been the subject of several proposals to demolish it or move it underground as part of downtown waterfront revitalization efforts. A section east of the Don River was demolished in 2001. The City of Toronto commissioned a study of possible options (keep, demolish, reconstruct) for the segment east of Jarvis Street to the Don River and City Council voted in June 2015 to rebuild the section. From the Queen Elizabeth Way (QEW) and Highway 427 interchange, east to the Humber River, the Gardiner is straight, eight-to-ten lanes wide. This is the former QEW segment. Due to its status as a former Ontario 400-series highway, and because of its more recent design (rebuilt in the late 1960s), this section was built to more recent standards than the Metro-constructed Gardiner. A system of collector and express lanes serves Kipling Avenue and Islington Avenue and this segment has a speed limit of 100 km/h rather than 90 km/h. From the 427 to Grand Avenue the highway passes through an area of residential, commercial and light industry. To the south are the neighbourhoods of Alderwood and Mimico. The speed limit on this section is 100km/h. From the Humber east, the speed limit is 90km/h. Construction along the Gardiner Expressway in October 2015. The highway curves approaching the Humber River passing the residential condominium towers of The Queensway – Humber Bay neighbourhood along the waterfront, the Mr. Christie cookie factory (which later became a part of Mondelēz International) and the Ontario Food Terminal on the north side. The segment east of the Humber is the original Gardiner segment and is six-to-eight lanes wide. Two eastbound lanes exit to Lake Shore Boulevard and the roadway narrows to the six lanes of the original segment at the bridge over the Humber River. East of the Humber, the highway curves along Humber Bay, passing to the south of the Swansea neighbourhood, before passing the Sunnyside waterfront on the south and High Park and the Roncesvalles neighbourhood on the north side. Along the north side from Roncesvalles to Exhibition Place is the neighbourhood of Parkdale. Like the rail lines which run parallel to the Gardiner along its north side, the Gardiner is built in a cut from Dowling Avenue to Dufferin Street and is below grade. From Dufferin to Strachan Avenue, the highway is flanked by light industry and the Liberty Village neighbourhood to the north and the buildings of Exhibition Place on the south side. The highway becomes elevated at this point, rising at a gentle grade with a view of the Toronto skyline straight ahead. From east of the Exhibition Place streetcar loop and just west of Strachan Avenue, the space below the elevated sections of the highway was enclosed for use as storage space. Bricked sections with windows can be seen when driving along Manitoba Drive or taking the streetcar in or out of Exhibition Place. GO Transit's Exhibition train station is located under the Gardiner Expressway with tracks located on the north side of the Gardiner. To the east of Strachan Avenue, the highway is entirely elevated, mostly overhead of Lake Shore Boulevard, between the buildings of downtown Toronto. Just east of Strachan, the highway passes Old Fort York on the north side and Coronation Park to the south. From Bathurst Street eastward to Yonge Street, the south side is developed with residential condominiums of the Harbourfront neighbourhood and office towers. On the north side, the highway passes the Rogers Centre, CN Tower and the Scotiabank Arena landmarks interspersed with residential condominium towers. North along Bay Street are the office towers of the Toronto Financial District. Two elevated eastbound lanes fork off east of Spadina to provide exit ramps to Yonge, Bay and York Streets. Between York and Yonge Streets the highway is narrowed to two lanes in each direction. From Yonge east to the Don Valley Parkway, the rail lines run parallel to the Gardiner on the north side, and to the north of the rail lines is the low-rise residential development of the St. Lawrence neighbourhood, the Distillery District and the West Don Lands. To the south of the highway, the land use is light industrial and waterfront lands in transition. The highway passes over the Don River with a ramp to connect to the Don Valley Parkway and descends in a ramp to end at Lake Shore Boulevard and Bouchette Street. The elevated section is supported by steel-reinforced concrete columns. The roadway itself was constructed on top of concrete slabs supported by steel girders. The height of the elevated section is higher than required to cross city streets and provide clearance underneath. The intent of this was to reduce traffic noise at ground level. The highest point of the elevated section is the eastbound ramp from the Gardiner to the Don Valley Parkway which goes up and over the westbound lanes, then drops to ground level. The elevated sections of the Gardiner use a tall wall concrete barrier topped with green metal blades. The blades act to reduce the glare of oncoming headlights from the opposing direction of traffic. During the original construction concrete parapet walls with metal railings were used in the outer sections as well as a divider between westbound and eastbound traffic. At grade sections west of Bathurst Street use steel guard rails, but originally featured a narrow grass median. The Gardiner Expressway was one of the first projects undertaken by the newly formed government of Metro Toronto. The route of the Expressway necessitated the paving over of parkland, demolition of residences and a popular amusement park, and a long elevated section to get through the downtown area. Planning was done stage-by-stage, from the Humber River east through downtown. The Humber Bay section was built according to initial plans. The route in the Exhibition Place area route changed over time from one along the lake shore into downtown, to one aligned along the railway north of Exhibition Place. The initial route east of Exhibition Place would have necessitated the moving or removal of Old Fort York, but was moved to a more southerly alignment after protest. The elevated section through downtown was then aligned over the existing Lake Shore Boulevard in the area. East of downtown, the initial plans were for a ground-level route east to Woodbine, but this was changed in conjunction with the planning of the interchange of the Don Valley Parkway into downtown from the north to an elevated section east to Leslie Street. Various routes to the east were proposed, but never progressed beyond planning studies due to public protest. Plans for the highway, first named the Lakeshore Expressway, were first developed prior to the formation of Metro Toronto. In the post-war period, the population of greater Toronto was growing at a rate of 50,000 persons per year, the ownership of private automobiles was growing, and the traffic between downtown Toronto and the western suburbs was regularly stuck in 'traffic jams.' (The Sunnyside stretch of the Lake Shore Boulevard and Queen and King Streets in the Parkdale–High Park area were apparently notorious for this.) Another reason for the proposal to build the lake shore highway was the expected opening of the Saint Lawrence Seaway and the need for adequate roadways to serve the expanded port facilities. In May 1947, the Toronto City Planning Board proposed building a four-lane "Waterfront Highway" from the Humber to the Don River. In November 1947, the City's works committee approved a four-lane highway, following a path beside the rail lines along the north of the Canadian National Exhibition (CNE) grounds, ending at Fleet Street to the East at a cost of $6 million, to be approved by a plebiscite. The Toronto Board of Control approved the plan, but City Council voted against the plan after 11 hours of deliberation, sending it back to the Board of Control. In December 1947, the Board of Control abandoned the plan, on advice that the bridges for the highway would not be built due to a shortage of steel. By 1952, the lake shore highway plan cost had escalated to an estimated $30 million. Toronto's Mayor Allan A. Lamport objected to the cost being borne solely by the City of Toronto. Lamport suggested that the road could be built either as a toll road or built by private interests. A toll road was opposed by the Ontario Deputy Minister of Highways J. D. Millar, who suggested that "cars would be waiting for miles" to pay a three-cent tax. Millar stated that "the Ontario driver was taxed and taxed heavily and expected his roads will be paid for." Toronto at the time was not yet planning to fully build the highway, only planning to build a new Humber bridge to connect the Queen Elizabeth Way and expand roads in the Sunnyside area, of which the city would pay $4.2 million and the province $4.7 million. At the same time Ontario was planning its Toronto Bypass north of the city and George Doucett, the Ontario minister of highways, pronounced the toll highway an "antiquated concept" and predicted that no-one would use it if it was tolled and instead would use the bypass instead. H. M. Bishop of the Ontario Motor League also criticized the toll highway saying if it was tolled it would "hardly see a car all day long. The net result would be to increase, not decrease, congestion on city streets." Toronto Board of Control abandoned the project in July 1952, stating that it would need additional funds not forthcoming from the Ontario government. In July 1953, prior to the formation of Metro Toronto, the Metropolitan Executive Committee, chaired by Fred Gardiner, ordered the planning of the Lakeshore Expressway as a four-lane or six-lane expressway from the Humber in the west to Woodbine Avenue in the east. The cost was estimated at $20 million. Route planning was given to the engineering firm Margison Babcock and Associates, with the proviso that an American firm expert in expressway building would be involved. Margison's plan was delivered in April 1954. The roadway was to be constructed in the Sunnyside area and CNE grounds to the south of the present Lake Shore Boulevard. South of the CNE grounds, the route would be on lands created from infilling of the shoreline to the breakwaters and an interchange was proposed in front of the Prince's Gate. East of the CNE grounds, the highway would be an elevated roadway above the existing Fleet Street, to just west of the Don River. The highway proceeded at grade from that point eastward, ending at Coxwell Avenue and Queen Street East. Interchanges were proposed for Jameson Avenue, Strachan Avenue, Spadina Avenue, York Street, Jarvis Street, Don Roadway, Carlaw Avenue, Keating Avenue (the present Lake Shore Boulevard East) and Coxwell Avenue. The cost was then estimated at $50 million. The plan also proposed extending Queen Street westwards through High Park to west of the Humber River to connect with the Queensway and extending Keating Avenue east to Woodbine Avenue. A list of neighbourhoods along the Gardiner from west to east. The shoreline route was opposed by the City of Toronto and the Toronto Harbour Commission, and Margison was tasked with plotting a route north of the CNE grounds. This plan was delivered in July 1954. The change to an inland route north of the CNE grounds was estimated to cost another $11 million as the homes to the west of the CNE grounds would have to be purchased and demolished. This change moved the route from the Humber to the Ontario Hydro right-of-way next to the railway tracks, saving 11 acres (45,000 m2) of waterfront. The expressway was moved to the north of Lake Shore Boulevard in the Sunnyside segment and the Jameson Avenue area. The inland route, while not opposed in the Sunnyside and Jameson areas, faced opposition in its proposed route in the CNE to downtown segment. Alternative route proposals emerged in 1954 from the Toronto Harbour Commission, which wanted the route moved further north, and planner Edwin Kay, who proposed a tunnel through downtown. The decision was then made to proceed with the non-contentious parts of the original Margison plan, to build a new Humber bridge to connect with the QEW, the Queen Street extension, and the Humber River to Dowling section, demolishing Sunnyside Park and South Parkdale. Metro also approved the eastern section of the expressway from Sherbourne Street to the east, but the central, elevated section was left for further deliberation. Metro approved $33 million for the eastern and western sections in its 1955 budget, but omitted the Humber River bridge. The route to the north of the CNE grounds followed a Hydro-electric right-of-way beside the railway tracks to the north of the Exhibition, using approximately 10 acres (40,000 m2) of CNE land, and requiring the removal of the original Dufferin Gate and the demolition of two other CNE buildings. To make up for the loss of lands, Metro infilled into Lake Ontario to the breakwater. East of the CNE grounds, the inland route proposed to fly over Fort York with a westbound on-ramp from Bathurst Street directly over the fort. Opposition from historical societies and the City of Toronto came to a head when the city refused to transfer the land to Metro Toronto. Gardiner himself and George O. Grant, the Metro Roads Commissioner, at first opposed the re-routing of the highway around the fort as it would mean a "greater than six-degree curve" in the highway, necessitating drivers to slow down. Gardiner rescinded his opposition to the change in March 1958 after visiting the site with a delegation from the City and historical societies. In 1959, Fort York was again under threat. A proposal was published to link Highway 400 to the Gardiner to meet in the vicinity of the fort. Gardiner proposed that Metro Toronto and the City share the costs of relocating the fort to the waterfront. In the end, the fort was not moved, the westbound on-ramp from Bathurst Street was cancelled, no interchange was built in the area and the Highway 400 extension was never approved. The Gardiner passes over some of the fort's property, and its width is wider in the area to provide for a possible connection with the 400. The highway is also extra high to allow for possible multiple interchanges. Construction on the expressway began in 1955 with the building of the Queen Street Extension and the Keating Avenue (now Lake Shore Boulevard East) extension to the foot of Woodbine Avenue. The Gardiner was built in segments, with the final section being completed in 1966. The cost was approximately $110 million ($839 million in 2018 dollars). Construction of the first part of the actual Expressway started in 1956 with the Humber River bridge, followed by the Humber to Jameson segment. Max Tanenbaum's York Steel supplied the iron girder sections that supported the road deck on the elevated sections. The route of the Expressway around Humber Bay necessitated the demolition of the Sunnyside Amusement Park on the lake shore, which had existed since 1925. Some amusements were moved to the CNE, others sold off or just destroyed. The carousel was moved to the newly built Disneyland. The Amusement Park lands were subsumed by the Lake Shore Boulevard expansion to six lanes. Only the Palais Royale hall, Sunnyside Bathing Pavilion and Sunnyside Pool were not demolished. A pedestrian bridge crossing was built from the foot of Roncesvalles Avenue to the Palais Royale site. To the east of Sunnyside, the 1800s-era 'South Parkdale' residential neighbourhood at the foot of Jameson Avenue was demolished in 1957. The Expressway, like the railway just to the north, was cut through the area at lake shore level. An interchange was built at Jameson with on and off ramps to Lake Shore Boulevard, and Lake Shore Boulevard was expanded to six lanes in the area. This created a pedestrian barrier to the lake shore for Parkdale neighbourhood residents to the north. Efforts made by community groups over the next 20 years to restore access to the lake shore, including plans to cover the section of the Expressway and railway line, did not come to fruition. A pedestrian bridge over Lake Shore Boulevard at the foot of Jameson Avenue was eventually built. Jameson Avenue, which had previously been a street of mansions, saw intense apartment building development after the building of the Expressway. The section between Humber River and Jameson Avenue was completed in 1958. The expressway, by then named the Gardiner Expressway, was officially opened by Gardiner and Ontario Premier Leslie Frost on August 8, 1958. When this section opened, it opened without guard-rails on the median dividing the different directions. Steel guard-rails and a 'glare shield' were approved for this section in 1965 at a cost of $200,000. The section between Jameson Avenue and Spadina Avenue was completed and opened on August 1, 1962 and the westbound lanes from York Street were opened on December 3, 1962. The eastbound lanes from Spadina to York opened in 1963. The elevated section starts from the north-east corner of the CNE. The route to the east of the CNE was modified to avoid passing over historic Fort York. This section was built wider to accommodate a possible interchange with the Highway 400 extension south to downtown, proposed by the Province of Ontario in 1956 and later cancelled. East of Fort York, the Gardiner was built entirely as an elevated route, through a predominantly industrial area, to the south of railway lands to reach downtown. The roadway was built directly overhead of Fleet Street (Fleet is now called Lake Shore Boulevard West) through much of this section. The expressway off-ramp to York Street was developed as a two-lane eastbound 'finger' flying over Harbour Street, south of the main roadway, descending to Harbour Street with a circular off-ramp to York Street northbound. This segment was completed in 1964. In the original proposal, this segment went to the ground with a clover-leaf interchange with the Don Valley Parkway. It was instead constructed as an elevated section that passes over Lake Shore Boulevard and at its eastern end forks into a flyover of the Don River mouth and a separate connector to the east. The section between the Parkway and Yonge Street was built eight lanes wide. This segment was opened in July 1966 without ceremony. It ended just east of Leslie Street, and traffic was forced to exit to an interchange at Leslie Street down to the former Keating Street, which was renamed Lake Shore Boulevard. The design left the eastern end open for a future connection with the Scarborough Expressway. This segment, built as part of the Queen Elizabeth Way (QEW) by the Province of Ontario, was transferred to the City of Toronto in 1997, and designated as part of the Gardiner. The original QEW highway was built in the 1930s and connected to the Gardiner in the 1950s. Before the transfer, the QEW was expanded to the current twelve-lane width in the 1970s. The Humber River was the western border of the City of Toronto until the amalgamation of all Metropolitan Toronto municipalities into one Toronto. After we had finished arguing with [The Board of Trade], Courtland Elliot, the president, made his annual report. In it, he suggested the road should be named the Gardiner Expressway. Before that, somebody had wanted to name an old man's home after me. Somebody else had wanted to name a sewage plant after me. I didn't exactly like those ideas and so when the third one came along I accepted the honour. By 1963, the first rooftop billboards along the Expressway were built, targeting the daily 40,000 to 60,000 motorists. Companies paid up to $3,000 per month to locate their billboard. Today, there are dozens of neon signs, billboards and video boards in the proximity of the Expressway, mostly in the sections between Roncesvalles Avenue to Spadina Avenue and east of Jarvis Street. In 1965, 62 yellow 'call boxes', containing phones for emergency assistance, were installed by the Ontario Motor League, fixed to poles on the shoulders. These remained in operation until the 1990s. In 1994, the RESCU traffic management system began operation on the Gardiner and Lake Shore Boulevard and stranded motorists became quickly detected by the CCTV cameras and operators quickly dispatch assistance. By 1966, rush hour traffic and accidents in the Jameson area meant that the Jameson westbound on-ramp was closed permanently during rush hours. That same year, after criticism of the safety of the expressway by Toronto coroner Morton Shulman, Metro started installing guardrails on the full length of the Gardiner and Don Valley expressways. In 1968, the speed limit was proposed to be raised from 50 mph to 55 mph (today it is 90 km/h). The expressway was already experiencing congestion at the time, and journalists openly questioned whether anyone could reach that top speed with the "horrendous volume of traffic" during peak rush times. In 1988, the unmaintained grassy hillside in the Sunnyside area on the north side of the Gardiner from Roncesvalles Avenue to Wilson Park Avenue was cleaned up and planted with floral logos, with 26 tonnes (29 short tons) of garbage removed in the process. The advertising, which pays for the maintenance and cleaning of the hillside, permits no slogans and no alcohol or tobacco logos. The logos are planted yew bushes and are maintained by an independent company on the land, which is owned by the Canadian National Railway. In the late 1980s, Metro Toronto proposed to widen the Gardiner to eight lanes from Strachan Avenue to the Humber, and extend Front Street from Bathurst Street west to connect with the highway. The widening proposal was never implemented as it depended on provincial funding which never materialized. Metro had planned the Front Street extension as part of allowing the Bay-Adelaide office complex and other development downtown to proceed. The Province did approve the Front Street extension, but the then-City of Toronto Council voted against it. The Front Street extension proposal was later resurrected as part of proposals to redevelop or dismantle the central section of the Gardiner. The old Gardiner and Lake Shore Boulevard bridges over the Humber River, which had been in service since the 1950s, were removed and replaced by new structures in 1998 and 1999. The old bridge pillars, which were resting on soil, not on bedrock, had sunk by a metre, giving the eastbound Gardiner a roller-coaster ride or "Humber hump". The bridges and connecting roadways were replaced at a cost of $100 million. Fatal collisions had occurred at the location, including an August 13, 1995 incident where a speeding eastbound Corvette became airborne and collided with a vehicle in the westbound lanes, killing three persons. In the 1990s, after 30 years of usage, the City found that the central elevated section needed extensive repairs, and the ongoing maintenance was expensive. Proposals started to be floated for the demolition of the Expressway. In the end, city council voted to have the elevated section extensively rehabilitated and the elevated section in downtown Toronto was closed down for extensive repairs. On April 1, 1997 the stretch of the Queen Elizabeth Way between Highway 427 and the Humber River was downloaded from the Ministry of Transportation of Ontario to Metropolitan Toronto and was redesignated as part of the Gardiner. The segment was not upgraded to contemporary standards when it was downloaded to the city, with particular concern over the old steel guard rail median. Portions of the guardrail was replaced by a concrete barrier in early 2007. The elevated section between the Don River and Leslie Street, intended for connection to the cancelled Scarborough Expressway, was eventually demolished in 2001. Demolition was first proposed in 1990 by the Crombie Commission and the Lake Shore-Gardiner Task Force. The segment was in need of expensive repairs and a 1996 environmental assessment determined that it would cost $48 million to refurbish the Gardiner from the Don Valley Parkway to Leslie St., but only $34 million to tear it down. The final cost of the demolition was $39 million. Eastbound traffic now exits to a newly constructed off-ramp that connects with Lake Shore Blvd. East, just west of Carlaw Avenue. In the wake of the eastern demolition, Lake Shore Boulevard East has been revealed from the cover of the highway. Green boulevards have been implemented along the wide thoroughfare. Paved bicycle paths extend eastward for approximately two kilometres from the Martin Goodman Trail at Cherry Street to Coxwell Avenue. A local artist created a commemorative piece for the demolished elevated expressway out of several of its giant supportive concrete pillars. The highway has not been expanded since its initial construction. Today,[when?] commuting traffic into and out of the downtown core moves very slowly during the rush hours, which has led to growth in commuting by other modes. Introduced in the 1960s, the province's GO Transit has increased train frequency and capacity along the Lakeshore route to the point where GO now carries 19% of inbound commuters to downtown, while the Gardiner carries 8%. The TTC carries 47% of commuters and other auto routes account for 26% of inbound commuters, according to 2006 figures. The elevated section built with concrete girders was not built to withstand the use of road salt in the winter. The salt created corrosion of the steel within the concrete bents (vertical columns and horizontal caps), which expanded and weakened the steel and caused pieces of concrete to fall off. Remedial work had to be applied starting in the 1990s at a cost of $8 million per year. The remedial work included sealing expansion joints to force the salty water into the drains and extensive patching of the concrete columns. Exposed steel was sand-blasted and repainted. The annual maintenance costs for the Gardiner Expressway were estimated in 2011 at $12 million per year. According to the City of Toronto, the City monitors the pillars on an ongoing basis and "re-coats" the pillars with new coatings of concrete, giving each new pillar an estimated 30 years of extended usage. A 4.5 kg section of concrete fell down onto Lake Shore Boulevard in June 2011. In May 2012, pieces fell from the elevated section near Jarvis, and a piece fell from the overpass over Parkside Drive. In June 2012, concrete fell from the elevated section at Yonge St. and Lake Shore Blvd. which struck a driver's vehicle causing minor damages. One eastbound lane was closed near Cherry Street due to deterioration. The concrete parapet wall could no longer support the light standard in that location. The light standard was instead relocated into the rightmost lane, and the lane was closed. Two locations, at Fort York Boulevard and near Cherry Street were reinforced to prevent "punch-throughs" (holes) from happening on the road surface, potentially knocking a large piece of concrete to the ground below and causing a dangerous incident for the vehicles above. It was estimated in December 2012 by the City of Toronto Infrastructure Department that the Expressway has a backlog of $626 million in repairs. Starting in 2013, the City intends to carry out $505 million worth of repairs over nine years. Temporary wood bracing and decking are being added to the underside of the road deck to prevent punch-throughs, but only provide a short term fix and will require a long term solution to prevent future deck collapse. In 2009, the City of Toronto commenced a study of the York/Bay/Yonge off-ramps and the Bay Street on-ramps "to support and enhance the pedestrian and park spaces in the immediate area while maintaining acceptable traffic capacity and operations." The preferred option identified in the study would be to reconfigure the off-ramp to connect at Simcoe Street, and close the on-ramp from northbound Bay Street to the eastbound Gardiner. The change to the ramps was approved in August 2010 by City Council. An Environmental Assessment was completed in 2013. In 2016, the City of Toronto began construction work on the project. In phase one, the new off-ramp at Lower Simcoe Street is to be built, feeding into a widened Harbour Street (from three to four lanes). The existing York/Bay/Yonge off-ramp started demolition in April 2017. This will be followed by the widening of Harbour Street. York Street Park will be built where the York Street off-ramp previously looped. The new off-ramp opened to traffic on January 28, 2018. A public trail and activity space was built underneath the Gardiner, between Strachan and Spadina Avenue. Named after the Gardiner's main supports (bents), The Bentway uses bents to create 55 separate areas for a variety of activities. The first phase of the project was completed on January 6, 2018. On March 5, 2007, a section of the Gardiner Expressway was closed between Spadina Avenue and Jarvis Street due to the threat of ice about the size of a kitchen table falling from the CN Tower. Several days before, a storm with snow and freezing rain had caused a great deal of ice to accrete on the tower. As the weather warmed and the sun heated the tower's concrete, large pieces of ice began falling off the tower and falling hundreds of metres to the ground below. Although nobody was injured, the Gardiner was closed as a precautionary measure. On March 6, cooler weather reduced the risk of falling ice, and prevailing wind conditions had changed, reducing the risks of ice falling onto the highway; the road was reopened subsequently. On May 3, 2007 at around 7:00 a.m., a chunk of concrete about the size of a loaf of bread fell from the Kipling Avenue bridge onto the Gardiner Expressway. It missed cars and caused no damage, bouncing harmlessly away despite the morning rush hour traffic. City crews were quickly sent to close off lanes of traffic to begin an inspection of the structure, which is a late 1960s post-tensioned design built by the province while it was still part of the QEW. This incident raised fears about safety of the highway, particularly with memories of the then-recent overpass collapse in Laval, Quebec, still fresh in the minds of motorists and media. On the evening of May 10, 2009, as part of the Tamil demonstrations in Canada, approximately 2,000 protestors blocked the downtown section of the Gardiner Expressway in both directions, leaving thousands of motorists stranded for several hours, and backing up traffic on the Expressway for several kilometres. Toronto Police chief Bill Blair called this demonstration by Tamil protestors on the Gardiner "unlawful" and "unsafe". Police forces from across the Greater Toronto Area including the Ontario Provincial Police were brought in for reinforcement. The highway was reopened shortly after midnight, when the protestors moved back to Queen's Park. This marked the first time that the Expressway was shut down due to a large-scale demonstration. The Gardiner, along with the Don Valley Parkway and Allen Road, were fitted with distinct cobra-neck 30-foot (9.1 m) lamp poles. They were first fitted with fluorescent tubes in the 1960s, which was changed to the orange low-pressure sodium (LPS) in 1978. (A 1960s experiment of installing lights on the elevated Gardiner's parapets was quickly shelved.) In the late 1990s, the low pressure sodium lighting was failing and most of the cobra-neck conventional poles were replaced in favour of shaded high-mast lighting, with high-pressure sodium lamps (HPS); however the elevated Gardiner still retained the LPS cobra-neck poles for seven more years, while the section immediately west of Dufferin Street still contains several with HPS lamps. The last remaining LPS lamps, which were no longer being produced, were all replaced by HPS in early 2006. Since the end of 2003, the conventional truss lighting poles that the province installed on the QEW segment in the late 1960s have been removed west of Kipling Avenue and east of Royal York Road, being replaced with shaded high-mast lighting like that used on the Don Valley Parkway. Starting in the 1990s, several proposals have been made to dismantle or replace the central elevated section. Lack of municipal funds and political will have repeatedly stalled such plans. In 1991, the Royal Commission On The Future of the Toronto Waterfront released a report entitled "Report 15: Toronto Central Waterfront Transportation Corridor Study". It determined that the combination of the Gardiner Expressway, Lake Shore Boulevard and railway uses tilted the land use to too much of a corridor use, and impacted negatively on the usage of the area. The report proposed that the City could A) retain or ameliorate; B) replace or C) remove the Expressway. The then-Metro Toronto and City of Toronto governments chose option "A" to retain or ameliorate. On November 23, 2016, mayor John Tory proposed the tolls for this highway along with the Don Valley Parkway. However, this plan has been rejected by the Ontario government. In March 2000, the Toronto Waterfront Revitalization Task Force proposed burying the section from east of the CNE to Yonge Street, as part of the plans for waterfront revitalization, at an estimated cost of $1.2 billion. The City of Toronto accepted the report in principle and formed the Toronto Waterfront Revitalization Corporation (TWRC), (today's Waterfront Toronto). Removing the Gardiner east of Spadina, and expanding Lake Shore Boulevard at a cost of $758 million. This was the TWRC's recommended option. extend Front Street west of Bathurst to connect with the Gardiner west of Strachan Avenue. Councillor Jane Pitfield, who was running for Mayor, criticized the proposal, stating that "From the canvassing I have done all over the city, the majority of people say they want the Gardiner to stay where it is." Suburban councillors Gloria Lindsay Luby and Doug Holyday came out opposed while inner-city councillor Kyle Rae fought for the proposal. Mayor David Miller did not favour the proposal either, stating that there were other, higher priorities. The proposal did not come to Council for discussion and vote. The Gardiner Expressway with dense development on both sides in downtown Toronto. The proposal planned to put tolls on the new roadway to pay for the cost of building it. Unsolicited proposals are made regularly by citizens, agencies and corporations of Toronto. In 2005, a proposal named the "Toronto Waterfront Viaduct" was presented by a group of Toronto citizens, calling for the replacement of the existing elevated expressway with an 8 to 10-lane cable-stayed viaduct over the Lakeshore rail corridor. This proposal combined the freeway with a new Lakeshore light rail transit system, and lanes for bicycle and pedestrian traffic. The proposed design used cantilever bridge structure to minimize disruption of the railroad. By building the replacement route on a parallel corridor, current traffic would not be disrupted. Two proposals were made public in June 2009, when the City of Toronto Council was considering the proposal to tear down the eastern section. Mark Fraser, a Toronto CAD technician, and local resident opposed to the removal of the Gardiner, put forth a proposed design for a complete overhaul of the Gardiner he called the "Green Expressway". The design would consist of either a channel or tunnel built under the Gardiner with two levels of traffic (one for local highway traffic, and one for express traffic through the city, a ground level local street and a Parks, and retail concourse built overhead of the street. Later in June 2009, Les Klein, a Toronto architect also opposed to the removal of the Gardiner, proposed adding an upper level deck covered with plants, bike lanes, walking paths and solar panels (for expressway lighting) on a 7 kilometres (4.3 mi) stretch of the expressway, entitled the 'Green Ribbon'. The estimated cost was between $500 million to $800 million. The Western Waterfront Master Plan calls for reconstruction of the Jameson/Dunn interchange to place the eastbound lanes of Lake Shore Boulevard onto the north side of the Gardiner, moving the Jameson westbound exit east to British Columbia Drive, converting the Jameson Street bridge into a pedestrian overpass to reclaim approximately 9 hectares (22 acres) of parkland. The Master Plan passed a Class environmental assessment in 2009. The City started to replace several deteriorating structures in May 2010, to prepare the structures for the new roadway alignment. The construction of the realigned Lake Shore Boulevard and the related Gardiner ramp changes is slated for after 2014, after completion of a detailed environmental assessment for the parkland and roadway project. In May 2008, Waterfront Toronto (the former TWRC) proposed the demolition of the segment from Jarvis Street to the Don River and construction of a widened Lake Shore Boulevard in the style of University Avenue at a projected cost of $200 to $300 million. The proposal shelved the previous plan to demolish the central section and the construction of the Front Street Extension. Waterfront Toronto proposed to get started on the environmental assessment of the demolition, which is expected to take up to five years and cost $10 million. Councillor Denzil Minnan-Wong criticized the proposal, pointing out that the city already had a $300 million backlog of road repairs. Mayor David Miller endorsed the proposal, noting that the funds for the demolition and the eight-lane boulevard would come from monies saved by not building the Front Street Extension, and money saved on the maintenance of the elevated highway. In July 2008, City Council voted to proceed with the environmental assessment. In March 2009, Waterfront Toronto started the environmental assessment consultation process, with open houses and an online consultation web site. The Terms of Reference were approved by City Council in May 2009 and the Government of Ontario in September 2009 and an Environmental Assessment was expected to start in April 2010. City staff abandoned the Environmental Assessment in November 2010, to await direction from the new Council after the election of Rob Ford as Toronto mayor. Councillor Minnan-Wong, who had become chairman of the public works committee of Council, later described the removal project as "dead", and the estimated $300 million cost as "too expensive" in light of a $270 million backlog on repairs of Toronto roads. Minnan-Wong was further quoted as saying that "tearing down the Gardiner Expressway, an important and vital transportation corridor, doesn't make sense". In 2013, as part of a staff report on condition the Gardiner, City staff reported to Council that a decision on the eastern segment would have to be made. The section was identified by staff as having reached the end of its lifespan, unless a significant rebuild were to be done. They estimated that it needed to be made no later than 2014 to co-ordinate with needed remedial work. The "remove" option would have removed this section of the Gardiner, freeing up acres of valuable waterfront property. After consideration of the proposal to repair the elevated section, Council voted in January 2013 to 'restart' the environmental assessment of the section east of Jarvis. Waterfront Toronto was engaged to deliver public feedback on various proposals, that of keeping the Gardiner, reconfiguring it or demolishing it. After the review, the consensus proposal was to demolish the expressway section as being cost-effective with little impact on commuters. Before Council was to vote on the proposal, Council decided instead to direct City staff to study a "hybrid" proposal, keeping that part of the Gardiner connecting the expressway to the Don Valley Parkway, while demolishing the rest. City staff studied the hybrid proposal and reported on the cost of the three options over 100 years in April 2015. The cost of the hybrid proposal was estimated at $414 million for construction and $505 million for upkeep. The 'keep as-is' proposal was the next most expensive at $342 million for a rebuild and $522 million of the next 100 years. The demolish proposal was the least expensive at a total of $326 million immediately and $135 million for upkeep of a new surface boulevard. After public consultations, City Council is to vote on the proposals after a final report is delivered in June 2015 from city staff. The review came to City Council for consideration at its June 2015 session. Prior to the meeting, several special interest groups weighed in with their opinions on the debate. A group of Toronto developers came out in favour of full removal. The Ontario Trucking Association and Canadian Automobile Association came out in favour of the "hybrid" option. Mayor John Tory announced he would support the "hybrid" option and speculation in the media was that the vote would be close between the "hybrid" and "remove" options. Debate started on June 10, 2015 and was completed on June 11, 2015. City Council voted 24–21 in favour of the "hybrid" option, 26–19 against the "remove" option, and 44–1 against the "maintain" option. To build support for the "hybrid" option among Councillors, Mayor Tory added proposals to direct City staff to study the routing of the connection to the Don Valley Parkway to try to retain as much development potential as possible compared to the "remove" option and report on the feasibility of tunnelling the section, something not even covered in the studies, and which would require a new environmental assessment and possibly a further delay. These passed as part of the approval of the "hybrid" option. Council has asked to receive the new studies for September 2015. Reconstruction of the Jarvis to DVP section and the removal of the section east of the DVP is not expected to start before 2019. In September 2015, staff returned with a report updating their progress on new routings for the hybrid proposal. Three new routes would free up more lands for development, with some external submissions received that will also be studied. Staff will report to Council committees in January 2016 and Council is expected to debate the matter again in February 2016. The City of Toronto and Waterfront Toronto completed a study of the district between the Lakeshore Boulevard and Queen's Quay from Yonge Street to Lower Jarvis Street. The block will be redeveloped from its current industrial/commercial use to residential/commercial usage. The large-scale development will affect the Gardiner Expressway connections and the local streets to accommodate the development. Among its recommendations are the removal of the eastbound Bay Street on-ramp, the shortening of the Lower Jarvis eastbound off-ramp to terminate at Yonge Street, the extension of Harbour Street east to Lower Jarvis, disconnection of Harbour Street from Lakeshore Boulevard at Yonge Street, and the extension of Church Street south via a tunnel to connect to Cooper Street at Lakeshore Boulevard. The Environmental Assessment completed in May 2018. On August 11, 1958, three days after the road opened, the Gardiner Expressway's first collision happened. The expressway has 28 cameras that are part of the Road Emergency Services Communications Unit system (found also on the Don Valley Parkway and Allen Road). Locations with two cameras have one on the elevated portion and one on the underside along Lake Shore Boulevard. Some cameras are off the Gardiner on Lake Shore Boulevard. Multi piece vertical blade delineator added on top of some barrier walls separating the east and westbound lanes. The following table lists the major junctions along the Gardiner Expressway. The entire route is located in Toronto. Exit numbers were designated and signed in October 2016, and are a continuation of the kilometre-based numbers on the Queen Elizabeth Way. 6.6 149 Jameson Avenue, Lake Shore Boulevard, Dunn Avenue On-ramps from westbound Lake Shore Boulevard to Gardiner are shut weekdays from 3pm to 6pm. On-ramps from eastbound Lake Shore Boulevard to Gardiner are shut weekdays from 6am to 9am. 8.8 153 Spadina Avenue No access is allowed to Lake Shore Boulevard from eastbound lanes. 9.4 154 York Street, Bay Street, and Yonge Street via Harbour Street Replaced former ramp closed on April 17, 2017, parallel to Harbour Street on southside, and looping ramp exit to northbound York Street or eastbound Harbour Street. Land for York ramp to become parkland. Opened January 28, 2018. A trailblazer for the Gardiner Expressway on Yonge Street. Duff, J. Clarence; Yates, Sarah (1985). Toronto Then & Now. Markham, Ontario: Fitzhenry & Whiteside. ISBN 0-88902-950-4. Fulford, Robert (1995). "Fred Gardiner's Specialized City". Accidental City: The transformation of Toronto. Toronto, Ontario: Macfarlane Walter & Ross. Levine, Allan (2014). Toronto: Biography of a City. Madeira Park, British Columbia: Douglas & McIntyre. ISBN 978-1-77100022-2. Margison, D. A. (1954). Proposed Lakeshore Expressway for Municipality of Metropolitan Toronto: Functional Report. Margison Babcock & Associates. White, Richard (2003). Urban infrastructure and urban growth in the Toronto region, 1950s to the 1990s. Toronto, Ontario: Neptis Foundation. ISBN 0973331402. ^ Google (April 30, 2010). "Map of the Gardiner Expressway" (Map). Google Maps. Google. Retrieved April 30, 2010. ^ "Gardiner Expressway: 'Big Daddy's' gift to Toronto". Toronto Star, July 10, 2016. ^ Levine 2014, p. 203. ^ White, Craig, ed. (2002). The Golden Horseshoe 2002. MapArt. p. 118. ^ a b c White, Craig, ed. (2002). The Golden Horseshoe 2002. MapArt. p. 119. ^ a b White, Craig, ed. (2002). The Golden Horseshoe 2002. MapArt. p. 120. ^ "Reducing Headlight Glare" (PDF). Road Talk. Ministry of Transportation Ontario. 1 (3): 2. June 1995. ^ Duff & Yates 1985, p. 119. ^ "Board Seeks High-Speed Arteries". The Globe and Mail. May 21, 1947. p. 4. ^ "$9,000,000 Super-Highways May Go To Vote on Jan. 1". Toronto Daily Star. November 13, 1947. p. 2. ^ "Toss Back $9,500,000 Plan in Lively 11-Hour Session". Toronto Daily Star. November 25, 1947. p. 3. ^ "Call Inglorious Retreat As Expressway Vote Off". Toronto Daily Star. December 20, 1947. p. 2. ^ a b c "Lamport Toll Road Out - Millar". Toronto Star. April 21, 1952. pp. 1–2. ^ "Toll Road Plan Antiquated, Not Needed - Doucett". Toronto Star. April 22, 2012. p. 1. ^ "More Provincial Aid Sought for Lakeshore Link". Toronto Star. July 17, 1952. pp. 1–2. ^ "$20,000,000 Lakeshore Expressway Gets Top Metro Planning Priority". The Globe and Mail. July 8, 1953. p. 1. ^ Margison 1954, p. 7. ^ "Plans Completed of Inshore Route for Expressway". The Globe and Mail. July 14, 1954. p. 30. ^ "Inland Expressway Extra Cost $11,000,000". The Globe and Mail. July 20, 1954. p. 1. ^ "All Expressway Plans Now Ready for Sifting". The Globe and Mail. October 2, 1954. p. 11. ^ "Start on 3rd Section of Expressway Urged". The Globe and Mail. November 11, 1954. p. 5. ^ "Maybe Next Year". The Globe and Mail. January 18, 1955. p. 5. ^ Haggart, Ronald (March 17, 1958). "Breached by Concrete". The Globe and Mail. p. 7. ^ "Gardiner to Route His Expressway around Fort, Chairman Capitulates With Honor". The Globe and Mail. March 27, 1958. p. 29. ^ "Plan Suggests Province Share In Moving Fort". The Globe and Mail. January 15, 1959. p. 9. ^ Bateman, Chris (February 14, 2018). "In Toronto, a Likable Space Arrives Underneath a Loathed Expressway". Citylab. Retrieved February 14, 2018. ^ "Tanenbaum family | Ontario Jewish Archives". Search.ontariojewisharchives.org. February 3, 2015. Retrieved January 29, 2018. ^ "Frederick G. Gardiner $13,000,000 Super-Highway Opened Today By Premier Frost". The Globe and Mail. ^ "Glare Shield is Planned on Gardiner". The Globe and Mail. March 3, 1965. p. 5. ^ "Expressway Proves That It Really Is". The Globe and Mail. August 2, 1962. p. 5. ^ "Three Lanes of Expressway West From York Street Open on Monday". The Globe and Mail. November 30, 1962. p. 1. ^ "Gardiner crush expected but police guard left idle". The Globe and Mail. July 16, 1966. p. 5. ^ White 2003, p. 16. ^ Gardiner, Fred (November 30, 1961). "How I Pulled the Rug from Underneath Suburbs Criminals". Metro News. Toronto Daily Star. pp. 21–22. ^ a b "Gardiner Expressway: Dreams and milestones ; Quick facts". Toronto Daily Star. May 6, 2000. p. B4. ^ City of Toronto. "Average Weekday, 24 Hour Traffic Volume, (Most Recent Counts from 2004-2008)" (PDF). See Insert B. ^ "Opening of Road Phones Ties Up Traffic An Hour". The Globe and Mail. September 28, 1965. p. 5. ^ "Our History". CAA. Archived from the original on October 26, 2010. Retrieved April 30, 2010. ^ "Jameson ramp may stay closed during rush hours". The Globe and Mail. June 11, 1966. p. 5. ^ "Accidents tripled by guardrails". The Globe and Mail. October 18, 1966. p. 9. ^ Papoe, Bob (November 15, 1989). "Advertising blossoms along Gardiner embankment". Toronto Star. p. C1. ^ Byers, John. "Tonks urged to improve Metro roads". Toronto Star. p. F8. ^ Turnbull, Barbara (May 22, 1998). "Hump gets bumped". Toronto Star. p. 1. ^ White, Vicki; Rushowy, Kris (August 14, 1995). "High-speed fiery collision kills 3 on the Gardiner". Toronto Star. p. A2. ^ "Gardiner in desperate need of repair: engineer". CBC News. April 10, 2006. Archived from the original on August 12, 2007. ^ Power, Kathleen (September 28, 2006). "20 years of studying the Gardiner". Toronto Star. p. A6. ^ Walls, Janice (December 19, 2000). "Demolition of Gardiner Expressway East under way". Daily Commercial News and Construction Record. 73 (245). p. A1. ^ "Transforming the Gardiner/Lakeshore Corridor" (PDF). waterfrontoronto.ca. Waterfront Toronto. May 31, 2008. p. 5. ^ a b "Toronto's ghastly Gardiner offers no easy fix". CBC. November 16, 2011. Retrieved November 30, 2011. ^ Gheciu, Alex (May 11, 2012). "Chunk of concrete falls from Gardiner for the second time in a week". National Post. Retrieved May 11, 2012. ^ "Gardiner Expressway concrete falls on Mercedes at Yonge St. and Lake Shore Blvd". Toronto Star. June 25, 2012. Retrieved June 26, 2012. ^ a b c Young, Leslie; Proskow, Jackson (December 11, 2012). "Documents warn of "punch-through", show frequent emergency repairs on Gardiner Expressway". Global News. Toronto, Ontario. Retrieved June 8, 2015. ^ Young, Leslie. "Documents suggest City downplayed Gardiner structural concerns". Globalnews.ca. Retrieved January 29, 2018. ^ "Gardiner Expressway York-Bay-Yonge Interchange Reconfiguration" (PDF). City of Toronto. Archived from the original (PDF) on October 15, 2012. Retrieved March 24, 2011. ^ "MODIFICATIONS TO THE YORK/ BAY/ YONGE RAMPS OF THE F.G. GARDINER EXPRESSWAY PUBLIC INFORMATION CENTRE APRIL 13, 2010" (PDF). City of Toronto. Archived from the original (PDF) on October 15, 2012. Retrieved March 24, 2011. ^ "York-Bay-Yonge Interchange Reconfiguration Municipal Class Environmental Assessment (Schedule B)". City of Toronto. Archived from the original on October 21, 2011. Retrieved March 24, 2011. ^ "Gardiner Expressway Lower Simcoe Ramp Reconstruction". toronto.ca. City of Toronto. Retrieved September 13, 2016. ^ a b "New Gardiner Expressway off-ramp opens to traffic". CBC News. January 28, 2018. ^ "WHAT IS THIS PROJECT?". Project: Under Gardiner. Archived from the original on June 6, 2016. Retrieved June 10, 2016. ^ Marlow, Iain; Henry Stancu; Nicole Baute (May 10, 2009). "Tamil protest moves off Gardiner to Queen's Park". Toronto Star. Retrieved May 25, 2009. ^ a b "Proposal to "Bury" the F.G. Gardiner Expressway Below Grade Between Dufferin Street and the Don River: Concept Review". City of Toronto. Retrieved March 17, 2009. ^ Jennifer Pagliaro (November 24, 2016). "Mayor Tory's road toll pitch praised as bold move | Toronto Star". Thestar.com. Retrieved January 29, 2018. ^ "Premier Kathleen Wynne to reject Toronto's request for tolls on DVP, Gardiner - Toronto - CBC News". Cbc.ca. January 26, 2017. Retrieved January 29, 2018. ^ "Wynne rejects road tolls for Toronto, Tory calls decision 'paternalistic and shortsighted'". CP24.com. January 27, 2017. Retrieved January 29, 2018. ^ "Waterfront Revitalization Chronology". City of Toronto. Retrieved March 10, 2009. ^ a b c Nickle, David (September 28, 2006). "City releases its plans for the Gardiner". The Villager. p. 1. ^ Lu, Vanessa (September 29, 2006). "Gardiner drives fiery debate; Councillors' positions reflect their ward locations in city Waterfront group recommends razing of eastern section". Toronto Star. p. B3. ^ Barber, John (July 19, 1996). "Private consortium eyes upgrade of Gardiner Widening, shift to toll road possible for Toronto's waterfront expressway". Toronto Star. p. A1. ^ "Toronto Waterfront Viaduct". 2006. Archived from the original on February 3, 2009. Retrieved March 17, 2009. ^ "Unemployed CAD tech pushes progressive Gardiner replacement". Citypulse24. June 2, 2009. ^ Lu, Vanessa (June 19, 2009). "Don't pull down Gardiner, green it up, architect says; New $500M upper deck would become a park". Toronto Star. p. GT1. ^ "Saving the Gardiner, losing the ugly". National Post. December 3, 2009. ^ "quadrangle architects: 'green ribbon' gardiner expressway toronto". designboom.com. Retrieved December 14, 2009. ^ "Toronto Western Waterfront Master Plan" (PDF). City of Toronto. August 21, 2009. pp. 62–66. Retrieved May 4, 2010. ^ "Western Waterfront Master Plan Class Environmental Assessment Notice of Completion" (PDF). City of Toronto. Retrieved July 6, 2010. ^ Jenkins, Jonathon (May 1, 2010). "Good grief! They're guttin' the Gardiner". News. Toronto Sun. p. 5. ^ "Western Waterfront Master Plan Final Report, May 2009 (Approved by Council August 5–6, 2009)" (PDF). City of Toronto. Retrieved July 6, 2010. ^ a b c Hanes, Allison (May 31, 2008). "Miller urges city to dismantle part of Gardiner; Easternmost Section; 'This proposal is a balancing of what's possible'". National Post. p. A16. ^ "Waterfront Toronto to proceed with environmental assessment of partial removal of Gardiner Expressway". Canada NewsWire. July 15, 2008. ^ "Gardiner Environmental Assessment and Integrated Urban Design Study". Waterfront Toronto. Retrieved April 8, 2009. ^ "Gardiner Expressway and Lake Shore Boulevard Reconfiguration EA Terms of Reference" (PDF). Waterfront Toronto. Retrieved May 5, 2010. ^ a b "Gardiner takedown study approved by executive committee". CBC. January 8, 2013. Retrieved January 8, 2013. ^ Church, Elizabeth (April 2, 2013). "Clock is ticking for decision on Gardiner Expressway, official says". The Globe and Mail. Toronto. Retrieved April 4, 2013. ^ "Unpredictable surface behavior is caused by fatigue-driven crack propagation". utoronto.ca. University of Toronto. Retrieved November 7, 2013. ^ "Gardiner Expressway: What you need to know about the options". CBC News. Yahoo News Canada. April 15, 2015. Retrieved April 17, 2015. ^ Madden, Maria (June 11, 2015). "City Council Votes in Favour of the Hybrid Option for Gardiner East". 640 News. ^ Marshall, Sean (September 29, 2015). "The Hybrid Gardiner, Revisited". Torontoist. Retrieved September 30, 2015. ^ "lower yonge precinct planning". waterfrontoronto.ca. Retrieved June 6, 2018. ^ WSP. "LOWER YONGE PRECINCT Municipal Class Environmental Assessment Study" (PDF) (pdf). Retrieved June 6, 2018. ^ DiManno, Rosie (December 13, 2012). "DiManno: Bury the Gardiner to undo the mistakes of yesteryear". Toronto Star. ^ "Toronto Neighborhood Map". The Star. Retrieved April 30, 2010. 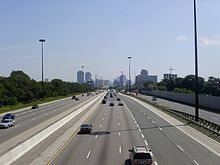 Wikimedia Commons has media related to Gardiner Expressway.